A Tool to Move/Export EDB All Data Items to Exchange Server with Ease. The software can easily export EDB files to Exchange and also permits to transfer all data items within. The tool also support MS Exchange 2016, 2013 & all below version to transfer EDB to Exchange. The EDB File to Exchange Migrator generates an instant preview of all the Exchange mailbox items like: emails, contacts, calendars, tasks etc. The utility show emails in retained formatting along with the attachments. 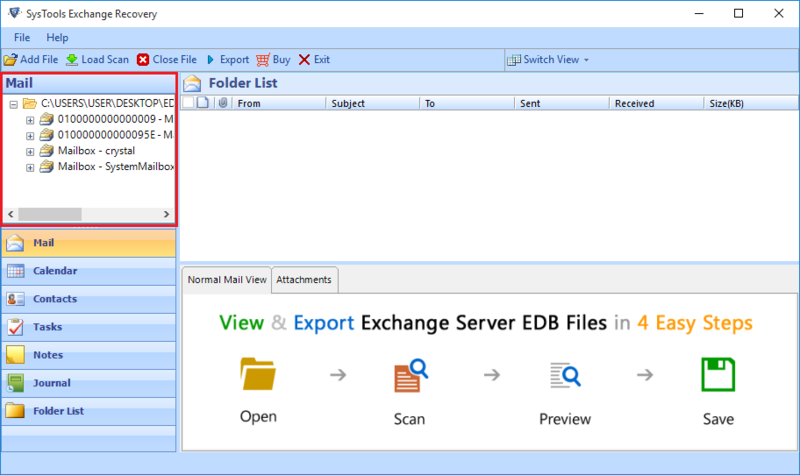 You can export selective items from EDB files to Exchange with the help of EDB to Exchange Server Tool. During the export process you can accomplish selective conversion with the help of advance settings feature. The tool offers a date & time based filter option. During the migration process of EDB Files to Exchange, you can apply the filters to only transfer selected emails. You can set the date range from “TO” to “FROM” & can export the emails accordingly. 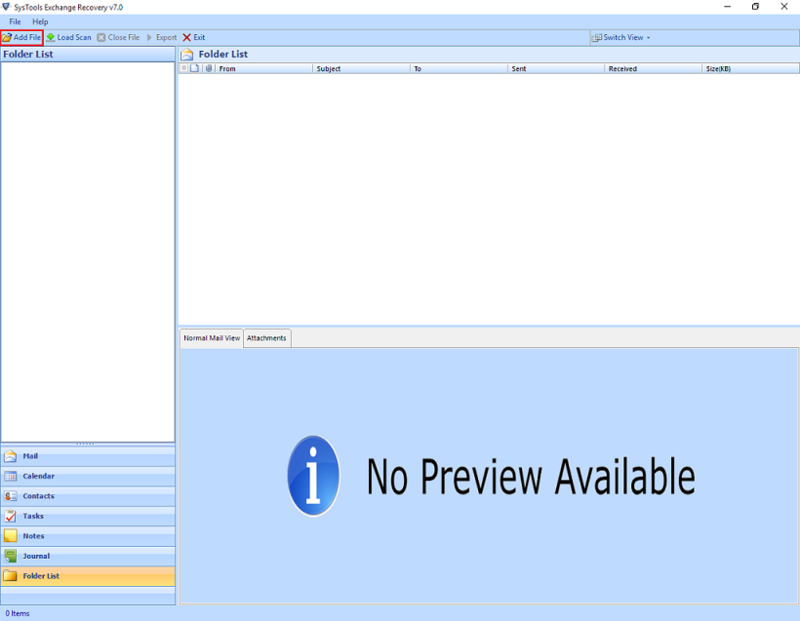 The EDB to Live Exchange Server Tool provides you to view the screen in horizontal as well as in vertical view. By default, the screen view mode remains horizontal but if needed you can change the view accordingly. Once the conversion process is completed, a small summary report will be generated. Which displays number of mailboxes or the file created. You can save the report in CSV file format for future reference. Run the EDB File to Exchange Migrator Tool & select ”Add File” button to select single or multiple Exchange mailboxes that is to be converted. 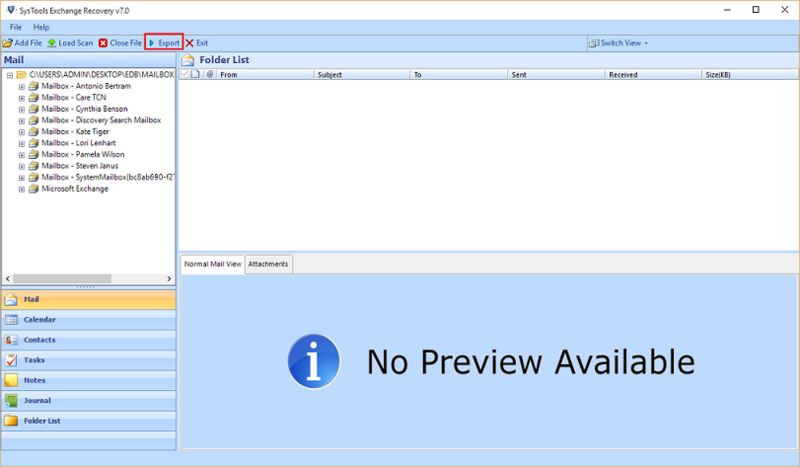 Preview the mailboxes from the left-pane in an EDB file. Now select the Export button to migrate all selected emails. 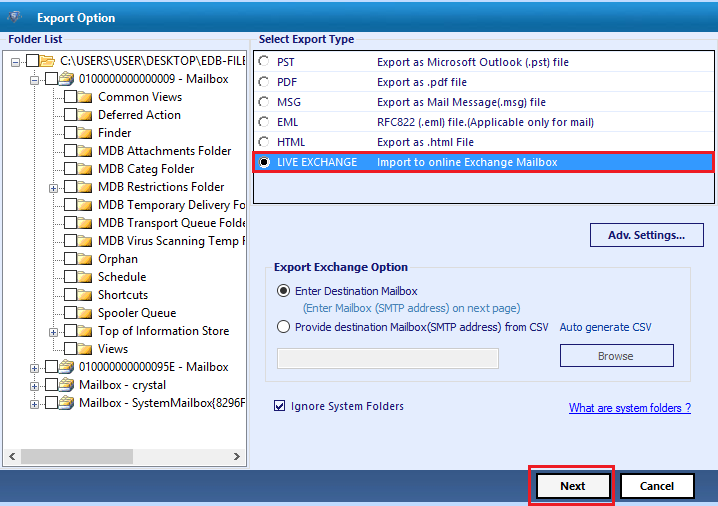 After selecting the Export option, select Live Exchange option to easily convert EDB to Exchange without any data loss. Does the EBD File to Exchange Migrator convert a limited size of EDB file? No,the tool does not contain any limitation on the size of EDB file. You can easily export multiple mailboxes. The tool is successfully tested with 1 TB of data file. Can I migrate Exchange Server public folder & private folder? Yes, by using EDB to EDB tool you can convert both public as well as private folders of Exchange Server mailboxes. Is there any need to have admin rights on Exchange Server mailbox to export scanned EDB data into it? Yes, to migrate scanned EDB data to Live Exchange Server you must have full admin rights on the mailboxes in the server. Does the utility run on Windows 8 PC? Yes, the tool is supportive to run on any Windows machine. Lately, we had issues with our Exchange Server database & had to undergone massive Exchange Server migration. I would suggest this EDB File to Exchange Migrator Tool. It has some really best functionality that has helped me to convert EDB to EDB easily. This software is simply amazing. I was quite satisfied with the way it export EDB file to Exchange server. Evidently I didn’t have that much time in hand & luckily got this tool. Thanks to the team! !